The Republic of Ireland is a country in Western Europe that occupies most of the island of Ireland. It borders on Northern Ireland in the north (which is a part of the United Kingdom). It has an area of 70.2 thousand km². The country’s name comes from the name of a Gaelic goddess of the land, Ériu. “Ireland” can be translated as “land of the goddess of the abundance” or “fertile land”. Administratively, Ireland is divided into four historic provinces—Ulster, Leinster, Munster, and Connacht—and those, in turn, are divided into 26 counties. 20 counties belong to the independent republic, and 6—to Northern Ireland. Ireland declared independence in 1949 and joined the European union in 1973. The capital of Ireland is Dublin, where roughly a quarter of the entire country’s population lives (1.4 million people). It is situated where the river Liffey flows into Dublin Bay in the Irish Sea. It is the largest city on the island of Ireland (its area is almost 115 km²), it is the main port in the Irish Sea, and it is the political, economic, and cultural center of the country. Ireland has a modern and relatively small economy. The farming industry, which once played a dominant role in the economy, is currently being superseded by manufacturing. The main engine of economic growth in Ireland is export. Increased consumer expenses, restored construction, and business investment also promote development. The economy of Ireland has been steadily growing in the last 20 years. The economic system depends broadly on trade. Several decades ago, the agrarian sector played a leading role in economic development, but now income from the farming industry amounts to no more than 10% of the country’s GDP. Revenue in 2017 totaled over USD 44 million. 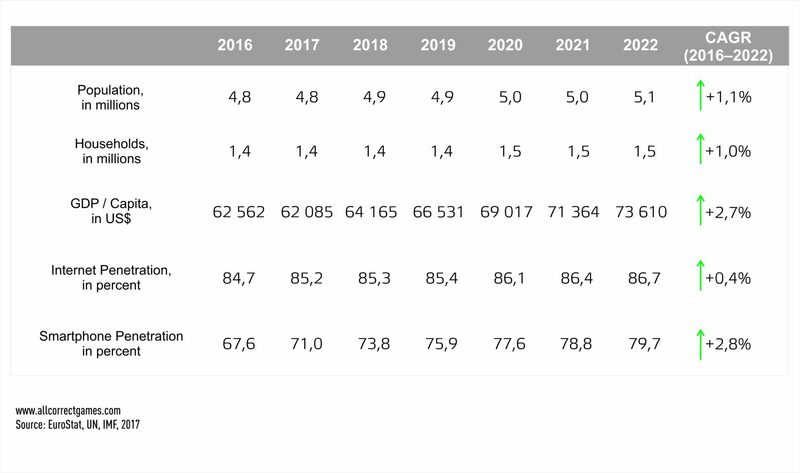 It is expected that this figure will grow by 5.2% annually before reaching USD 58 million in 2022. 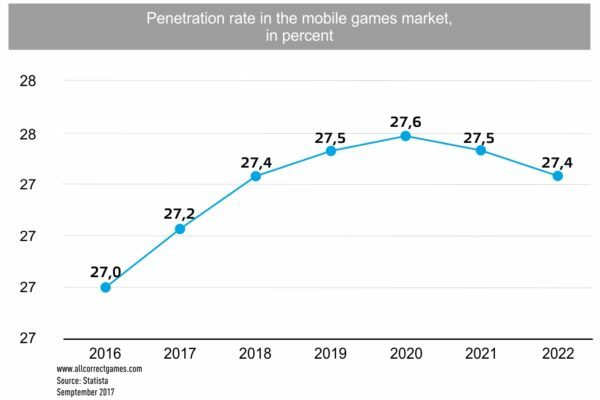 In 2017, the ratio of mobile users to citizens amounted to 27.2% , and this should reach 27.4% by 2022. 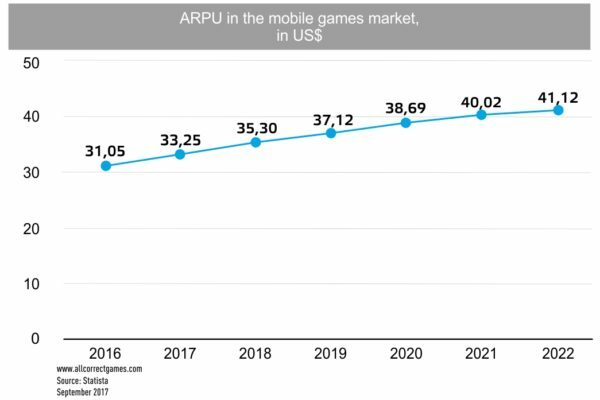 Average revenue per user (ARPU) was USD 35.30. 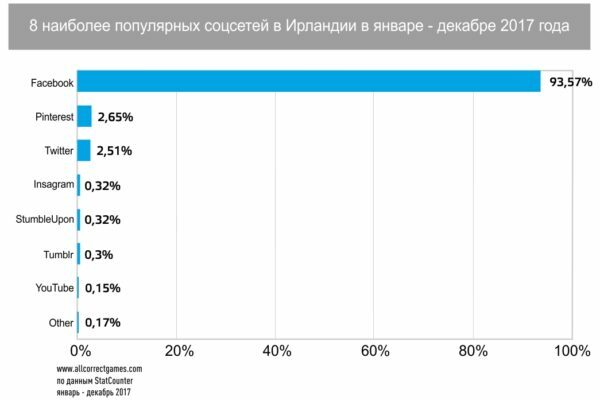 Average cost per install (CPI) for iOS was USD 1.75, and for Android was USD 1.56. 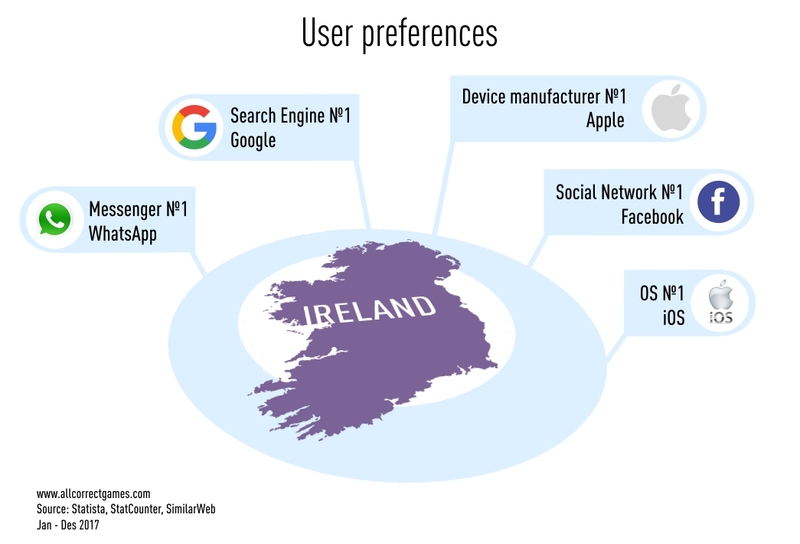 Among mobile platforms in Ireland, the Android operating system dominates (49.65%), along with the social network Facebook (93.57%), the Google search engine (98.28%), Facebook and WhatsApp messengers (according to Priori Data). 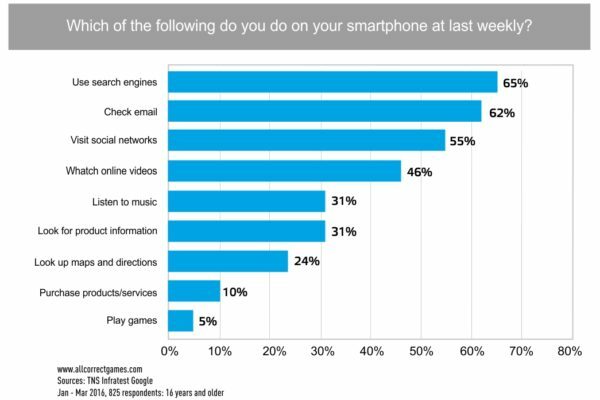 The most popular device manufacturer is Apple (49.65%). 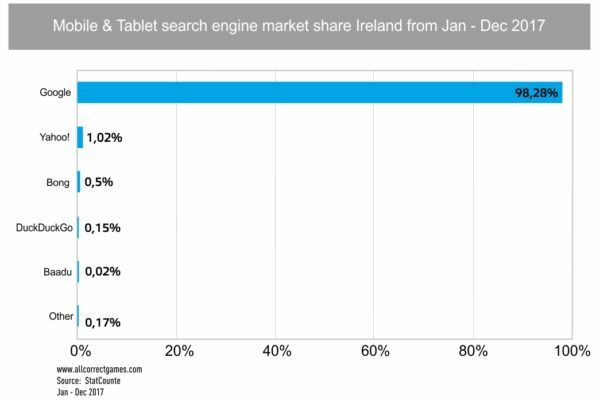 According to Priori Data, genres such as Action, Arcade, Sports, Simulation, and Adventure are popular among Irish players. 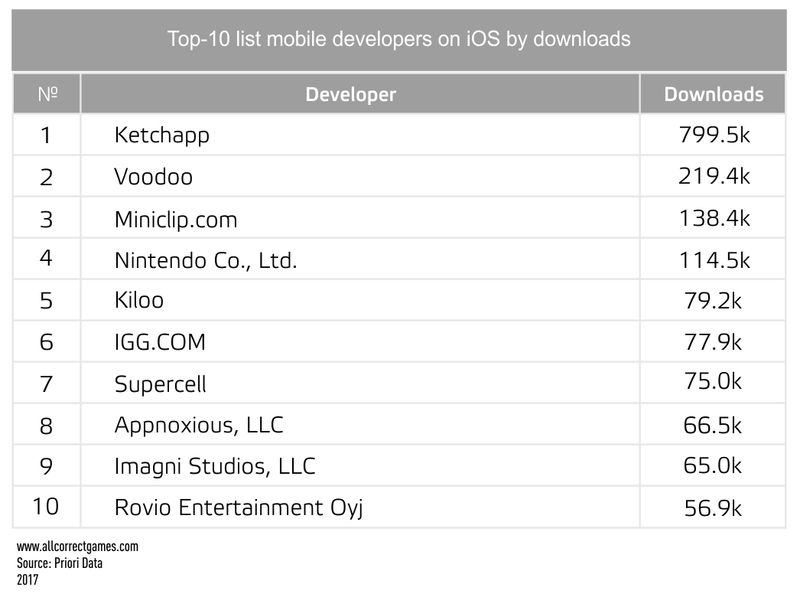 On iOS, the most popular free games in September 2017 were Flip Master, Car Driving School Simulator, and Bowmasters. 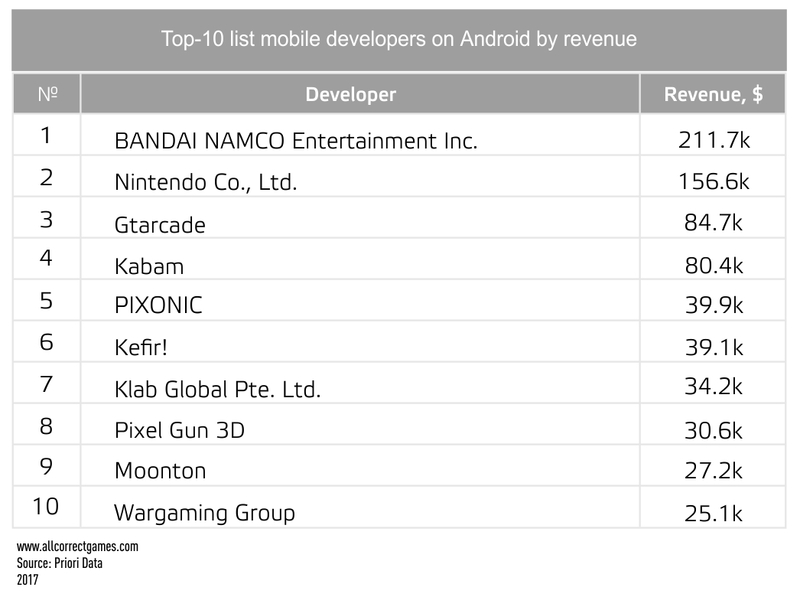 Among paid games, Minecraft, Five Nights at Freddy’s, and Terraria were in the lead. 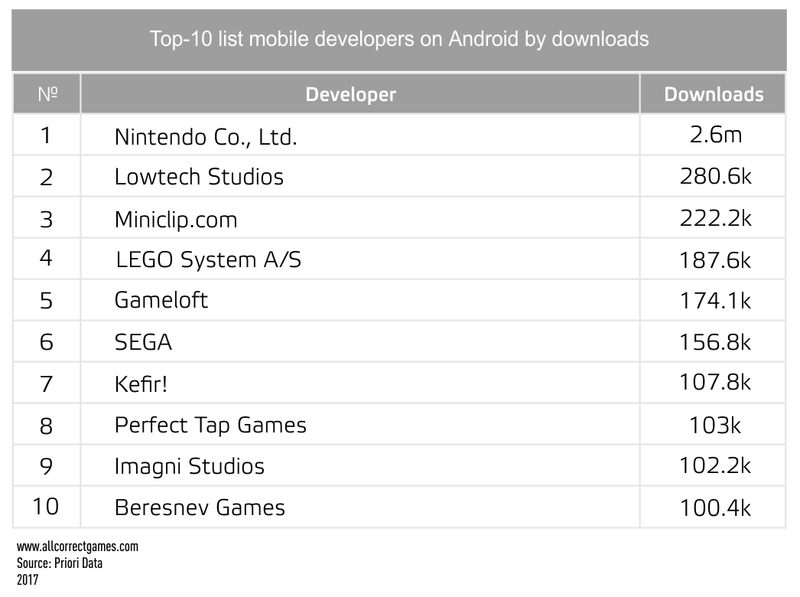 On Android, the most popular free games in September 2017 were Word Trip, ROBLOX, and Coin Master. 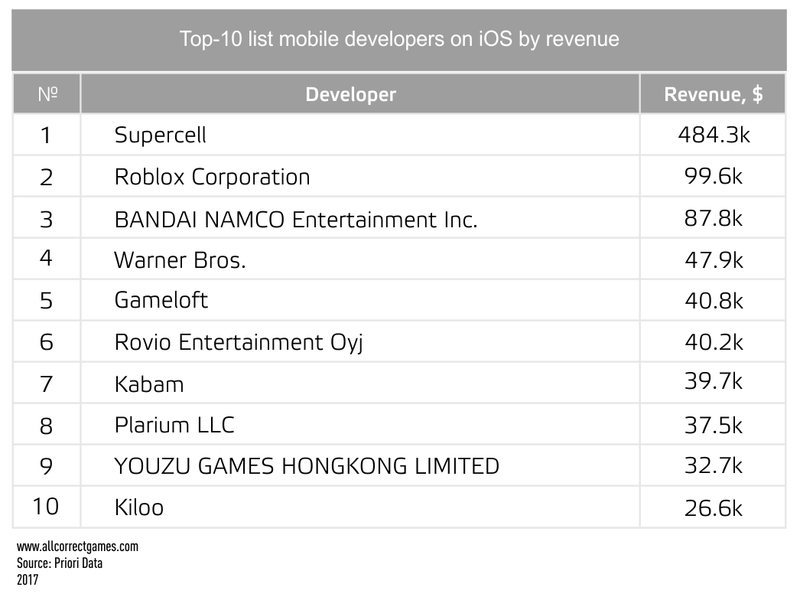 Among paid games, Minecraft, Football Manager 2017, and Farming Simulator 18 were in the lead. 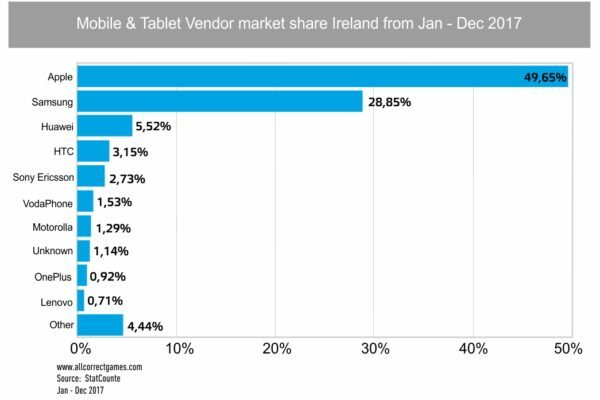 These statistics show how Irish users used their smartphones in 2016. 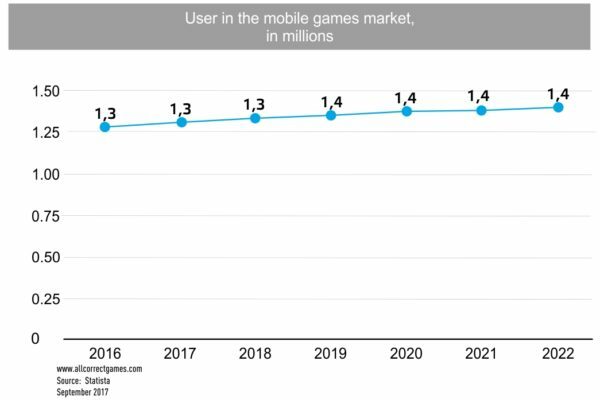 Within the reporting period, 5% of users played mobile games at least once per week. 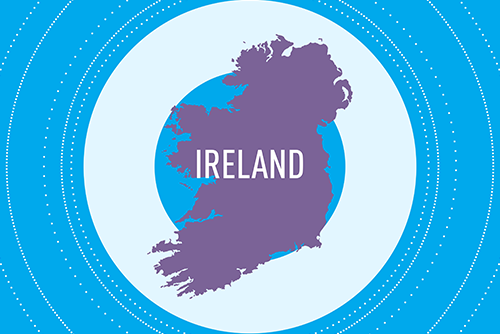 On the gamedevmap site you can familiarize yourself with a list of game developers from Ireland. Ireland’s mobile developers include such companies as 9th Impact, Bluebear Technologies, Simteractive, and Superhippo Games. 9th Impact creates games based on the universes of various TV shows. The company’s popular products include Ninja Go Endless Runner and Biker Mice from Mars. Bluebear Technologies creates games in the Casual, Lifestyle, and Education genres, and its successful products are Shave Santa, Crazy Makeover, Crazy Hospital, and Crazy Shave. Simteractive gained fame thanks to its new game Eden Isle: Resort Paradise. In this simulator, the player has the opportunity to build their own resort city, manage it, play with friends and help them build. The large Irish company Superhippo, with offices in Bucharest and Montreal, develops and publishes games for adults. It also actively participates in the localization of Japanese adult games in English. These games include Flower Knight Girls, Pero Pero, and Ultra Adventure! Go Go—Osawari Island. 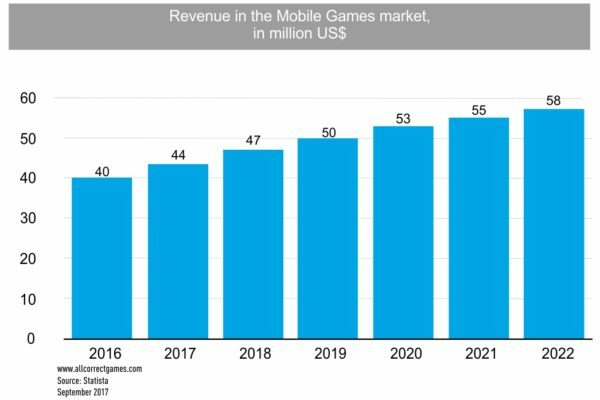 The mobile games developed by the company in the family-friendly category include Don’t Be Squared and Pirate Legends TD. The Irish language (Gaeilge, Irish Gaelic) is the language of the Irish people and one of the Celtic languages; along with Scottish Gaelic and Manx, it belongs to the Goidelic subgroup. The Irish language is one of two (along with English) state languages of the Republic of Ireland. On June 13, 2005, the decision was made to include Irish among the working languages of the European Union, which went into force from January 1, 2007. This language is a close relative of the Manx (Gaelg/Gailck) and Scottish (Gàidhlig) languages, which are also in the Goidelic language group. There is a certain degree of mutual comprehension between these languages, particularly between Irish and Scottish Gaelic. The grammar and vocabulary of these languages are relatively similar, but the spelling and pronunciation differ, particularly the orthography of the Manx language. There are three main dialects of the Irish language: Munster (An Mhumhain), Connacht (Connachta) and Ulster (Ulaidh). The defining characteristics of the Irish language include its distinctive orthography, mutations of initial consonants, word order, the existence of two copulative verbs, and its conjugated prepositions. Old Irish is also noted for its extremely complex verb system, built on the contraposition of “absolute” and “conjunctive” inflections (ranges of endings selected depending on the position of the verb in the sentence), along with its prototonic and deuterotonic forms (historically they differed in the position of the stress, but by the Old Irish period this led to the forms of one and the same verb significantly differing from one another). The Irish language uses Latin letters: Cló Rómhánach (Roman Type). 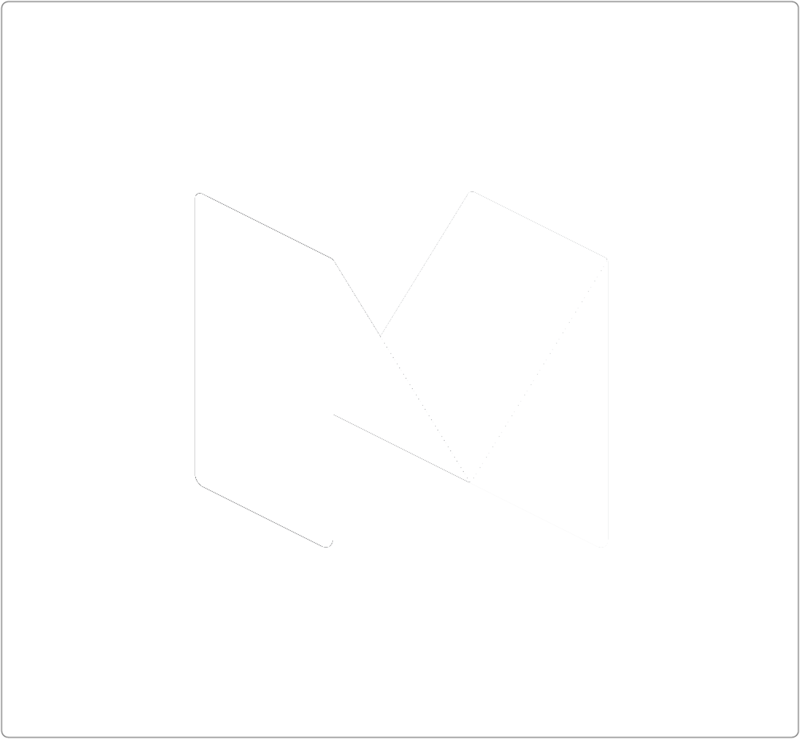 It previously used its own script: Cló Gaelach (Gaelic Type), harking back to insular style. Up to the middle of the 20th century, books in Irish were published using Cló Gaelach; today it is used only for decorative purposes, for example on signs. Throughout the 1950s–1960s, a standardized form of the Irish language was developed, known by the name An Caighdeán Oifigiúil (official standard). It includes elements of the three main dialects, taking the Connacht dialect as the basis for its phonetic transcription. This is the variant of Irish used in most schools. In 1999, Foras na Gaeilge (FnaG) was created. It is a regulator for the Irish language responsible for preserving it and propagating it throughout the island of Ireland.  This organization is an agency of the North/South Language Body, which was formed as a means of fostering cross-border agreement in accordance with the conditions of the Good Friday Agreement to oversee collaboration in reinforcing the native languages of Ireland. Although the local language is Irish (or Irish Gaelic), 94% of the population speaks English (according to Europeans and their Languages research). Irish English differs significantly from standard English, firstly in its pronunciation. Like Canadians and Americans, the Irish pronounce the rhotic [r] and often do not adhere to the basic rules of English phonetics. This means that the word “hard” is pronounced as [hɑɹd], and “turn” as [tɝn]. It’s no surprise that the Irish are inclined to pronounce [i:] as [ey], and the word ‘great’ is practically pronounced as [ɡɹe:t]. In Irish English, you’re unlikely to meet the interdental consonants [ð] and [θ] so characteristic of standard English, which means that “three” here sounds like “tree”. This is far from the only feature of English spoken by the Irish: for example, “tu” at the start of a word (Tuesday) sounds like “chu” (“chuesday”), and words containing the cluster “lm” (film) are supplemented with vowels (“fillum”). The influence of Common Celtic on Irish is reflected in its grammar, particularly in forming the perfect, so it’s worth being preparing for English sentences like “She has just cooked dinner” in Irish to be formed as “She is after cooking dinner.” The verb forms of the first and third person match, so an Irishman will say “I looks at him”, or more precisely “Looks I at him”—this is the word order in the Irish language. The influence of the Gaelic language is still great, and although the Irish speak English, they often insert Irish words into their sentences.